For over 10 years The HopeWorks Connection with The Toronto Children’s Concert Choir (TC3) has been providing workshops in Afro-Caribbean Drum & Dance and Traditional Folk Song to schools across the Greater Toronto Area. This hands-on experience introduces the drum rhythms and dance steps of the African people, from the Motherland to the Caribbean, as well as traditional folk songs. This form of interactive learning is ideal in getting young people interested and engaged with other cultures. Students feel a great sense of accomplishment when they try a physical activity they have never experience before and succeed at it. All our workshops will leave your students smiling, enthusiastic and energized by a fun-filled educational experience. Workshops are offered for all grade levels and can be tailored to fit the need of your class. Discover and learn African and Caribbean culture in a fun, interactive way. Improve active listening skills through drumming workshops. Boost self-esteem and confidence by trying something new and succeeding. Increase motor skills and coordination. Reduce stress and improve overall wellbeing. Channel aggressive, destructive impulses into positive, creative activity. An energizing form of physical activity. Expand their knowledge and experience of the performing arts. Drumming workshop: With a variety of African drums, our teachers teach your students different rhythms from the coast of Africa to the Caribbean. Dance workshop: Our enthusiastic teachers teach a variety of African-Caribbean dance movements to the students and put them together to create a routine. All dance workshops are accompanied by a one of our Afro-Caribbean drummers. Dance and Drum workshop – This is our most popular school workshop. Half the class learns the dance to a specific song while the other half learns the drumming to that song. They then switch so all students get to experience making the music and the movements. The students then come together to dance and drum the complete song. 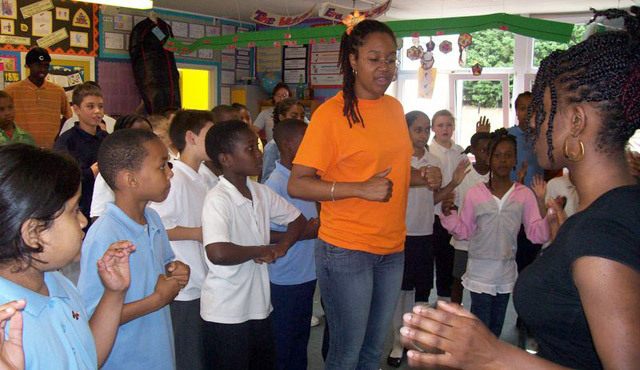 Traditional Folk Song – Here we teach the students an African-Caribbean folk song and explain the meaning behind the song. Divided into groups, the class learns different harmonies and rhythms then they are brought back together to sing the song in unison. *This workshop can be tied into the drum and dance workshop above. Drum Circle: for up 12 students. Our drum teacher leads the students through different rhythms and beats at various speeds. Workshops can last anywhere between 45 min to 1 ½. To book a workshop please fill out the form below. For more information call: 416 939 1702.